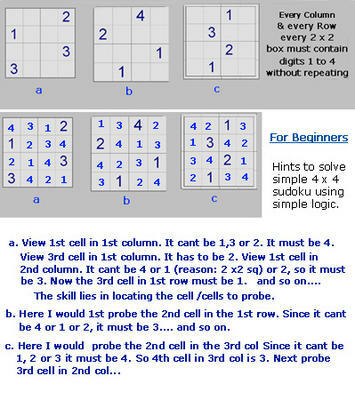 Nice graphic and all on how to solve 4x4 sudoku grid. Thank You. I have done one more post on Sudoku in colored symbols for teaching. My next posting will be a board game 6 x 6 on Sudoku. Unfortunately I will not be able to develop it and if you want to join , please let me know soonest. great post. How long have you been blogging? I really love this blog and have added it to my favourites. I have just set up a website all about answer puzzle sudoku, perhaps you could take a look and let me know what you think. I play this sudoku game and I found it very interesting.